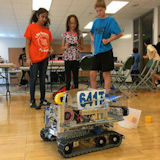 Explorer Post 1010 has one team registered in the 2016 FIRST Tech Challenge robotics program. The theme and title of the challenge is Velocity Vortex. 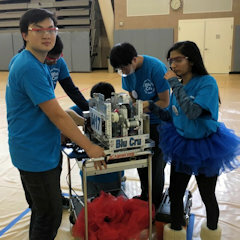 We are Team 6417 - the Blu Cru. We kicked off our effort in early September 2016. The challenge required us to rebuild our whole robot from the previous year. We signed up for two qualifier tournaments, Sidwell Friends on Sunday, December 11, and Bullis on Sunday, January 15. The tournament at Bullis was cancelled because of weather. 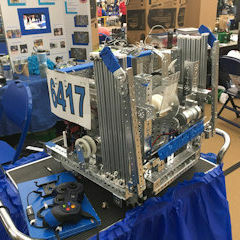 To prepare for the tournament, we created an engineering notebook, submitted a promotional video, and prepared a presentation board for team judging at the tournament. We were very lucky to have Silvia Vidaurre from Lockheed Martin as an adult mentor. We did great at Sidwell Friends in December. We received awards in many areas, and a third place Inspire award. This gave us an invitation to the State Finals. We were 1st place in the Control Award for use of sensors. Here are the ranking and scores for the qualifying tournament. On February 12, 2017, Team 6417 headed to the Maryland State FTC Finals. Again our team did great, but we were up against the best teams in Maryland. 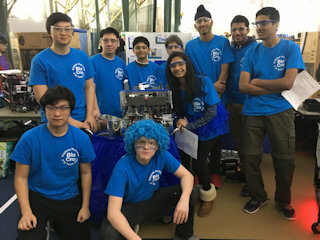 We made it to the finals in our division. Here are the ranking and scores for our division. Here are the overall awards for the tournament. Overall, we had a great year. We just fell short of being invited to the Super Regional tournament in March. We can do it next year. We need to focus on outreach before the challenge gets going in September 2017.